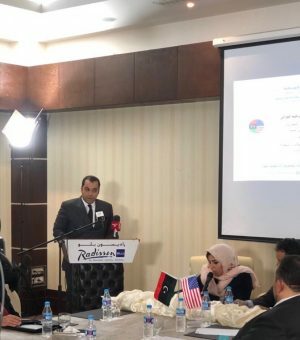 A seminar on Libyan-American relations – past, present and future – took place at the Raddison Blu Mahary Hotel in Tripoli on Sunday, organised by the Libyan-American Friendship Association. Security cooperation between the two countries was the theme of the talks by the deputy director of the American-Libyan Chamber of Commerce, Ahmed Al-Ghazali. Other speakers at the well attended event included representatives from the Energy Research Centre, the National Oil Corporation, the Libyan Archives Centre, the Libyan Arab Holding Company and the foreign ministry. There were a series of papers on various aspects of cooperation – the economy, investment, social interaction – as well as in the fight against terrorism and the so-called Islamic State.